Lady Gaga, known as “Mother Monster”, looked very patriotic in her all-red Gucci two-piece, glittery pant suit as she performed the National Anthem alongside a piano on one of the biggest stages in music and NFL history at the SuperBowl50 this Sunday. 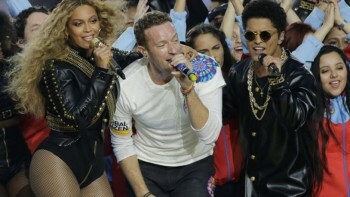 Coldplay opened the half-time show with a colourful performance, followed by the Queen B and Bruno Mars. Beyonce began her performance with Run The World and her outfit was a tribute to Michael Jacksons from when he performed at the SuperBowl. The superstar had been expected to deliver a political statement and performed ‘Black Lives Matter rallying cry’ during half-time. The dancers formed an ‘X’ on the field in reference black rights campaigner Malcolm X. Tina Knowles, Beyonce’s mother, also posted an image of herself and the dancers giving the black power salute backstage. It was a moving performance and ended with fans in the audience holding signs that read ‘Believe in love’ when put together. Beyonce also stole the show when she announced she’s going on a world tour. “The Formation World Tour” launches April 27! On a heavier note, model and social media star Katie May suffered a stroke on Monday after she fell and injured her neck during a photo shoot in Los Angeles last week. She was in critical condition until Thursday evening when she passed away. Our thoughts and prayers go out to her family. There will be no Entertainment Insight next week, due to reading week but we will return February 23. Thanks for tuning in. Stay happy, stay healthy and stay golden!